Skin cancer is one of the most common cancers in the world. Non-melanoma skin cancer refers to a group of cancers that slowly develop in the upper layers of the skin. The term non-melanoma distinguishes these more common types of skin cancer from the less common skin cancer known as melanoma, which can be more serious. In the UK, more than 100,000 new cases of non-melanoma skin cancer are diagnosed each year. It affects more men than women and is more common in the elderly. The first sign of non-melanoma skin cancer is usually the appearance of a lump or discoloured patch on the skin that continues to persist after a few weeks, and slowly progresses over months or sometimes years. This is the cancer, or tumour. In most cases, cancerous lumps are red and firm and sometimes turn into ulcers, while cancerous patches are usually flat and scaly. Non-melanoma skin cancer most often develops on areas of skin regularly exposed to the sun, such as the face, ears, hands, shoulders, upper chest and back. See below for more information about the symptoms of specific types of non-melanoma skin cancer. See your GP if you have any skin abnormality, such as a lump, ulcer, lesion or skin discolouration that hasn't healed after four weeks. While it's unlikely to be skin cancer, it's best to be sure. Non-melanoma skin cancers usually develop in the outermost layer of skin (epidermis), and are often named after the type of skin cell from which they develop. Basal cell carcinoma (BCC) usually appears as a small, shiny pink or pearly-white lump with a translucent or waxy appearance. It can also look like a red, scaly patch. There's sometimes some brown or black pigment within the patch. The lump slowly gets bigger and may become crusty, bleed or develop into a painless ulcer. 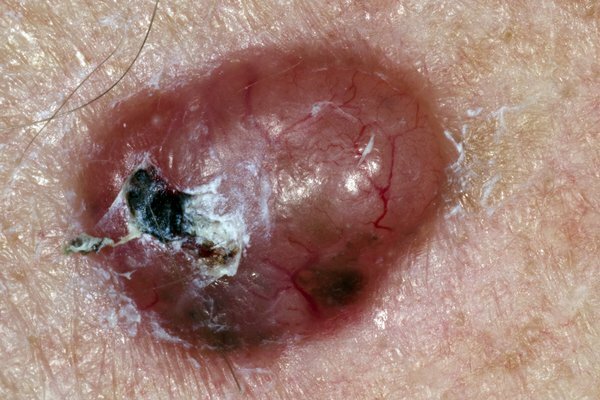 Squamous cell carcinoma (SCC) appears as a firm pink lump with a rough or crusted surface. There can be a lot of surface scale and sometimes even a spiky horn sticking up from the surface. The lump is often tender to touch, bleeds easily and may develop into an ulcer. Bowen's disease is a precancerous form of SCC sometimes referred to as squamous cell carcinoma in situ. It develops slowly and is easily treated. The main sign is a red, scaly patch on the skin that may itch. It most commonly affects elderly women and is often found on the lower leg. However, it can appear on any area of the skin. Although not classed as non-melanoma skin cancer, Bowen's disease can sometimes develop into squamous cell carcinoma if left untreated. Actinic keratoses, also known as solar keratoses, are dry, scaly patches of skin caused by damage from years of sun exposure. The patches can be pink, red or brown, and can vary in size from a few millimetres to a few centimetres across. The affected skin can sometimes become very thick, and occasionally the patches can look like small horns or spikes. Like Bowen's disease, actinic keratosis isn't classed as non-melanoma skin cancer, but there's a small risk that the patches could develop into squamous cell carcinoma if untreated. What causes non-melanoma skin cancer? Overexposure to ultraviolet (UV) light is the main cause of non-melanoma skin cancer. UV light comes from the sun, as well as from artificial tanning sunbeds and sunlamps. Read more about the causes of non-melanoma skin cancer. Your GP can examine your skin for signs of skin cancer. They may refer you to a skin specialist (dermatologist) or a specialist plastic surgeon if they're unsure or suspect skin cancer. You'll have an urgent referral (within two weeks) if you have squamous cell skin cancer. Basal cell skin cancers usually don't need an urgent referral, but you should still see a specialist within 18 weeks. Find out more about NHS waiting times. The specialist will examine your skin and may carry out a biopsy to confirm a diagnosis of skin cancer. A biopsy is a procedure where some of the affected skin is removed so it can be studied under a microscope. Read more about diagnosing non-melanoma skin cancer. Surgery is the main treatment for non-melanoma skin cancer. It involves removing the cancerous tumour and some of the surrounding skin. Other treatments for non-melanoma skin cancer include freezing (cryotherapy), anti-cancer creams, radiotherapy and a form of light treatment called photodynamic therapy (PDT). The treatment used will depend on the type, size and location of the non-melanoma skin cancer you have. Treatment for non-melanoma skin cancer is usually successful as, unlike most other types of cancer, there's a considerably lower risk that the cancer will spread to other parts of the body. Basal cell carcinoma doesn't usually spread to other parts of the body. There's a small risk (up to 5%) of squamous cell carcinoma spreading to other parts of the body, usually the lymph nodes (small glands found throughout your body). However, for both BCC and SCC there can sometimes be considerable skin damage if the tumour isn't treated. At least 9 out of 10 (90%) non-melanoma skin cancer cases are successfully cured. Read more about treating non-melanoma skin cancer. If you've had non-melanoma skin cancer in the past, there's a chance the condition may return. The chance of non-melanoma skin cancer returning is increased if your previous cancer was large in size and high grade (severe). If your cancer team feels there's a significant risk of your non-melanoma skin cancer returning, you'll probably need regular check-ups to monitor your health. It's also important to be aware that if you've had a non-melanoma skin cancer, your risk of developing another one in the future is increased because these cancers are often multiple. This means it's important to regularly examine your skin to check for new tumours. Non-melanoma skin cancer isn't always preventable, but you can reduce your chances of developing it by avoiding overexposure to UV light. You can protect yourself from sunburn by using high-factor sunscreen, dressing sensibly in the sun, and limiting the amount of time you spend in the sun during the hottest part of the day. Sunbeds and sunlamps should also be avoided. Regularly checking your skin for signs of skin cancer can help lead to an early diagnosis and increase your chances of successful treatment. Read more about sunscreen and sun safety.